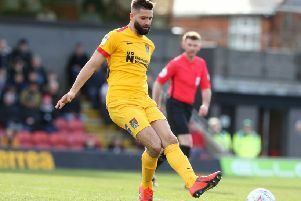 Unhappy boss Dean Austin has admitted he may have been ‘too loyal’ to one or two of his misfiring team so far this season, and it is now down to him to ‘find the formula’ to turn the Cobblers’ form around. After a run of just one win in 10 matches in all competitions, it seems the Town manager’s patience may be wearing a little thin with certain players as he prepares for the visit of rock-bottom Notts County this Saturday (ko 3pm). Despite the team’s troubles, Austin has backed his players to the hilt and been pretty consistent with his team selection in the past few weeks. He has shown plenty of belief and trust in his players, but that trust has simply not been repaid. Even after the humbling 3-1 home defeat to Cheltenham Town, Austin made just one change for the trip to Port Vale last weekend, with Andy Williams replacing John-Joe O’Toole. But it was a familiar story as wasted chances and poor defending saw the team slip to a 2-0 defeat, and Austin is hinting he may shake things up for Saturday’s crunch clash with a Magpies team that has yet to win a game this season. “Maybe I have been too loyal,” said Austin when he was asked about his consistent team selections. Speaking to the media on Tuesday afternoon, Austin added: “I am not very happy, as you can tell today. “I am not my normal, jovial self, because I am not happy. “If I am not winning, then I am not happy, no matter what people say, and people think I am a nice guy and all that rubbish, well I am not interested. Pressed on whether or not finding that formula would involve personnel changes as well as system changes, Austin was non-committal. But he did make it clear that he will not be altering his philosophy of trying to get his team to play an attacking, creative brand of football. “I am not going to massively go away from anything I have done from when I was caretaker to being manager, and I am not going to drastically change anything,” said the Cobblers boss. “I am not going to look to change the style, as I am a believer in that when you are losing you are not doing everything wrong, and when you are winning you are not doing everything right. Those areas of improvement were clear for all observers to see at Vae Park last weekend, and Austin groaned: “Last Saturday, at 0-0 or 1-0, we have four unbelievable opportunities, and we never worked the goalkeeper on any of them. Saturday’s match with Notts County has taken on pretty huge proportions, with Town needing a win to keep them clear of the relegation zone, but Austin insists his team is close to getting it right. “It is small margins with us at the minute, and I honestly believe that, it is small details,” he said. “I know what we are doing in training, I know how hard we are working in training, I know how diligent we are in our preparation.